We're all well aware of the power of throw pillows to transform a room. But have you ever seen such a transformation like the one found in this design by Alyse Studios? It's the pillow equivalent of a power suit. A plush carpet in a light, neutral shade sets the stage for a cozy atmosphere that's heightened by an overstuffed ottoman used in lieu of a coffee table. Meanwhile, on the back wall, an eclectic gallery of images brings personality to the elegant piano underneath it, while greenery fills up an empty corner with its striking long leaves. But of course it's that pile of colorful pillows — with its array of kaleidoscopic patterns and shades — that makes this look complete, creating a design that's as playful as it is inviting. If you're leery that so many soft squares would be overwhelming, take a page from this example's book and surround them with a subdued color palette. They'll be a bright display that'll put a fun finishing touch on the atmosphere. 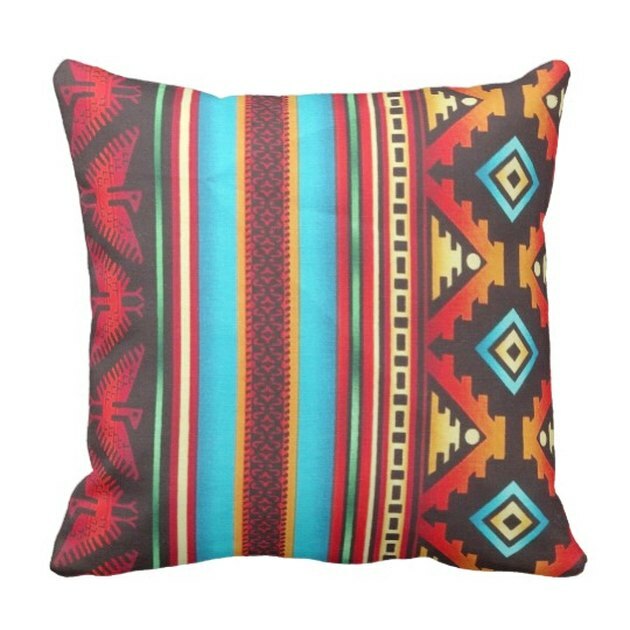 Play up your design with a few patterned pillows of your own.